As soon as I saw this dress I knew I wanted it! I had first noticed it mentioned on social media on @thefoldline and @SimplySewing_ on Twitter. I knew that if Rachel and Kate from the Fold Line were to have any involvement at all in a project it would be a good one! I instantly fell in love with the style of the dress, particularly the flattering pleats, and the contrasting placket, collar and cuffs reminded me very much of a couple of my very favourite RTW dresses that I reach for time and time again when I want to look my best. So off I went and purchased Simply Sewing magazine issue 22. This was the first time I had bought this particular magazine and it won’t be the last. Apart from the Jodi dress pattern there are tons of projects that I will be making up in the future – one of which is the pattern for the Sew Over it Erin skirt – watch out for a blog on that very soon. The magazine has a lovely feel to it and I have really enjoyed picking it up and relaxing with it this month (when I haven’t been sewing)! I was really pleased with the paper pattern and instructions. The pattern pieces were printed on good quality paper and clearly marked. The instructions were clear and simple, not overwhelming at all which can sometimes be the case, and accompanied by plenty of colour photos to help you along. I decided to use some fabric that I already had in my stash. It is a gorgeous grey and green print that I picked up last year from a trip to Florida, and I have been itching for the opportunity to use it. It is called Fresh Mint Posies Grey I believe and it is from www.emmamila.com I picked it up at Walmart. For the most part it was simple to make. The pockets may look like they would be tricky but are as easy as anything when you follow the instructions carefully. I do love me some pockets in a dress, I mean who doesn’t? The contrasting cuffs are super cute too. So pretty with the little split detail and again not difficult at all when you are following such precise instructions. The photographs on the instruction sheet were particularly helpful with this part of the pattern. The collar I found to be the most challenging part of this make. It is not a simple round collar but has a little shape detail along the inner edge. This is a tiny bit tricky and I had to be very very careful when sewing this edge. Lots of care needs to be taken as you would expect with trimming and clipping these edges so that the finished collar lays flat. I’m pretty pleased with how it came out though and I think I worried about it more than I needed to. The button placket was the finishing touch and I love the grey contrasting pieces on this dress, it really is something special. Something else to mention is the zip. It requires a 22″ invisible zip and whilst I contemplated using an exposed zip, as I really like the look of these I stuck with the invisible and glad that I did. I have only sewn an invisible zip once before, way back when, so had some concerns, but after a little internet research (mainly YouTube) I felt confident to go for it. Again I was really pleased with the outcome. I did purchase an invisible zipper foot for my machine for this project which was great fun to use and I know I will get a lot of use out of it in the future. Everything else is pretty much straightforward. The set in sleeves are not a problem, a little bit of topstitching and understitching here and there and ‘bob’s your uncle’ a dress that comes together really quickly. It is a great fit for me and came up true to size which I’m so happy about as I really don’t have the patience to make a toile (naughty, naughty) so is always a risk with beautiful fabric like this. The only very minor alteration I made was to turn the hem up slightly more as I’m only 5’2″. I think next time I may make it in a less fussy fabric, as the beautiful pleats are a little lost amongst the design of the fabric, but so happy with it overall. The long sleeves are a nice feature of this dress too and are perfect for Autumn. I hope you have enjoyed my thoughts on this pattern. Thanks for taking the time to read my review. I have loved making this dress and can’t wait to wear it now. Have you made a Jodi dress? I would love to hear from you. 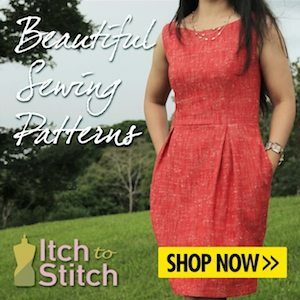 Do check out www.thefoldline.com it is a gorgeous online sewing community full of patterns, reviews and news. Check it out! Dressmaker of the Year – Winner for the ‘Ready to Wear’ Category.